When Super Bowl 50 commences Sunday, Carolina LB/DB Shaq Thompson, a rookie from the University of Washington, will be the 58th ex-Husky to strut on pro football’s biggest stage. Thompson will have a chance to become the first ex-UW player to earn a ring since WR Jermaine Kearse, who collected his following Seattle’s 43-8 demolition of Denver two years ago at MetLife Stadium. Kearse would have won a second ring if not for the historic botch at the end of Super Bowl XLIX that needs inspire no further hair-pulling here. Had Kearse done so, he would have become the fourth ex-Husky with multiple rings. UW boosters won’t want to hear this, but four Washington State alums already have multiple rings, including one Cougar who owns four. Plus, Washington State produced a Super Bowl MVP, an award that has so far escaped an ex-Husky. The top jewelry heist for former Huskies and Cougars came following the 2001 season (XXXVI) when Washington’s Hakim Akbar, Fred Coleman and Lawyer Milloy, all of whom played under coach Jim Lambright, along with Washington State’s Drew Bledsoe, earned rings when New England defeated St. Louis 20-17. In only two other Super Bowls did as many as three former Huskies and/or Cougars collect rings. After the 1994 season (XXIX), Washington’s Dennis Brown and Dana Hall and Washington State’s Brett Carolan were part of San Francisco’s 49-26 win over San Diego (XXIX). Following 1997 (XXXII), Brian Habib, Harald Hasselbach and David Richie, ex-Huskies all, were part of Denver’s 31-24 win over the Green Bay Packers. Mike Wilson, Washington State, 1981, ’84, ’88, ’89 San Francisco 49ers: A ninth-round draft pick in 1981, Wilson had the good fortune to land with the 49ers as they were about to become the “Team of the ’80s.” Wilson played in 136 games through 1990, earning rings following all of the aforementioned seasons. He became one of five players to earn four rings with San Francisco in the 1980s, joining Eric Wright, Joe Montana, Keena Turner and Ronnie Lott. A Los Angeles native who played under Jim Walden, Wilson caught six TDs in his three years (1978-80) in Pullman, and then spent 10 years in San Francisco as a backup receiver. He caught 159 passes for 2,199 yards and 15 touchdowns in regular-season games and 24 passes for 271 yards and two TDs in the postseason. He retired following the 1990 season. Ray Mansfield, Washington, 1974-75 Pittsburgh Steelers: Mansfield played center under coach Jim Owens from 1960-62 and was a member of the 1960 Rose Bowl team that defeated Minnesota 17-7. The Philadelphia Eagles selected Mansfield in the second round of the 1963 draft. He played one year in Philly followed by 13 with the Steelers, earning rings following the 1974-75 seasons. Mansfield twice (1972, 1975) made UPI’s All-Conference team. A graduate of Kennewick High, Mansfield began his pro career as a defensive lineman, but switched to offense and started at center for the Steelers for more than a decade, once appearing in 182 consecutive games. Mansfield died in 1996 after suffering a heart attack while hiking in Grand Canyon National Park. Allan Kennedy, Washington State, 1981, ’84 San Francisco 49ers: A three-year WSU letterman at tackle between 1976-80, Kennedy was part of San Francisco’s championship teams in 1981 and 1984. Never a star, he made just one start in a pro career that lasted three seasons. Kennedy began his pro career as the 267th overall pick by the Washington Redskins in the 1981 draft. 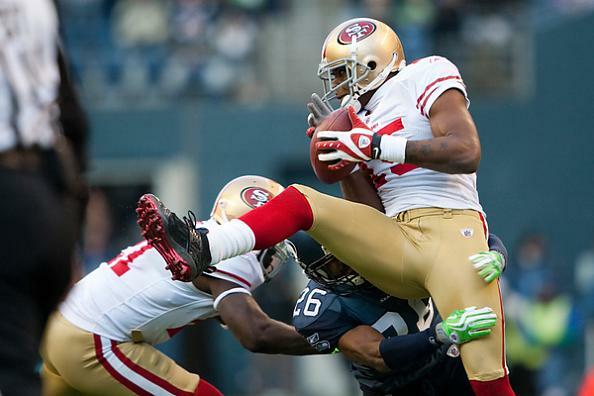 Cut during training camp, he signed with the 49ers, ending his career with the second of his two rings. Erik Howard, Washington State, 1986, ’90 New York Giants: Howard, who played at Washington State in the mid-1980s, played on his first Super Bowl winner as a rookie in 1986, and his second in 1990, when he made the Pro Bowl for the only time in his career. In all, Howard lasted 11 NFL seasons with the Giants and Jets, appearing in 139 games with 95 starts. He retired after the 1996 season. In the 1990 NFC Championship against the 49ers, Howard made one of the biggest plays in Giants history. With two minutes left, the Giants trailed 13-12, and the 49ers had the game all but wrapped when Howard forced Roger Craig to fumble. Teammate Lawrence Taylor recovered and the Giants went on to win on a last-second field goal by Matt Bahr. Howard earned his second SB ring seven days later. Mark Rypien, Washington State, 1987, ’91 Washington Redskins: Rypien spent the first two years of his NFL career on Washington’s injured-reserve list, but was technically part of Washington’s Super Bowl win in January 1988. Three years later, as the Redskins’ starter, he led them to a 14-2 record and a victory over Buffalo in XXVI. He was voted the game’s MVP. Little remembered about Rypien is that he signed with the Seahawks in August 2002 as a backup quarterback and played in two preseason games before he was cut. Rypien’s final game as a pro was June 20, 2006: as part of a promotional gig, he played one game for the Rochester Raiders of the Great Lakes Indoor Football League. In 11 NFL seasons, Rypien threw for 18,473 yards and 115 touchdowns. Kevin Gogan, Washington, 1992-93 Dallas Cowboys: An offensive lineman from 1984-86, Gogan went to the Cowboys in 1987 as an eighth-round draft pick, and had an under-appreciated and controversial NFL career. He played 14 years, starting 179 of 213 games, and appeared in three Pro Bowls. During his ring-winning seasons, Gogan started at right guard. After a six-year stint in Dallas, he played with the L.A./Oakland Raiders (1994-96), San Francisco 49ers (1997-98) , Miami Dolphins (1999) and San Diego Chargers (2000). He had a reputation of playing dirty. He appeared on the cover of Sports Illustrated in 1998 as the poster boy for “The NFL’s Dirtiest Players.” That same year, Gogan became the first player ejected from a Pro Bowl game (for going for Neil Smith’s legs). Harald Hasselbach, Washington, 1997-98 Denver Broncos: A native of Amsterdam, Hasselbach lettered only one year for the Huskies (1989) and went undrafted. He played the first part of his pro career in Canada, winning a Grey Cup title with the Calgary Stampeders in 1992 before catching on with the Broncos in 1994. He played in 112 games for Denver, through, 2000. He started at defensive end in XXXIII. Hasselbach recorded 17.5 sacks during his seven seasons in the NFL. Washington: Steve Thompson (1968 Jets); Ray Pinney (1978 Steelers); Dave Browning (1980 Raiders): Dave Pear (1980 Raiders); Tony Caldwell (1983 Raiders); Anthony Allen (1987 Redskins); Ron Hadley (1988 49ers); Ray Horton (1992 Cowboys); Dennis Brown (1994 49ers); Dana Hall (1994 49ers); Eric Bjornsen (1995 Cowboys); Brian Habib (1997 Broncos); David Richie (1997 Broncos); Ernie Conwell (1999 Rams); D’Marco Farr (1999 Rams); Hakim Akbar (2001 Patriots); Fred Coleman (2001 Patriots); Lawyer Milloy (2001 Patriots); Damon Huard (2003 Patriots); Corey Dillon (2004 Patriots); Omare Lowe (2004 Patriots); Roy Lewis (2008 Steelers); Mark Brunell (2009 Saints); Jermaine Kearse (2013 Seahawks). Washington State: Don Horn (1967 Packers); Eason Ramson (1981 49ers); Eric Williams (1991 Redskins); Bret Carolan (1994 49ers); Chris Hayes (1996 Packers); Drew Bledsoe (2001 Patriots); Jason David (2006 Colts). ❝my neighbor’ s mate Is getting 98$. HOURLY. on the internet❞….A few days ago new McLaren F1 subsequent after earning 18,512$,,,this was my previous month’s paycheck ,and-a little over, 17k$ Last month ..3-5 h/r of work a day ..with extra open doors & weekly. paychecks.. it’s realy the easiest work I have ever Do.. I Joined This 7 months ago and now making over 87$, p/h.Learn More right Here:181➤➤➤➤➤ http://GlobalSuperEmploymentVacanciesReportsProfitable/GetPaid/98$hourly…. .❦:❦:❦:❦:❦:❦:❦:❦:❦:❦:❦:❦:❦:❦:❦:❦:❦:❦:❦:❦:❦:❦:❦:❦:❦:❦:❦:❦:❦:❦:❦:❦:❦:❦:❦:❦:❦:❦:❦:❦:❦:❦:❦::::181.